Ariel Sharon died January 11, 2014, eight years and one week after he suffered a stroke January 4, 2006. At the time of his stroke, Sharon was the 11th Prime Minister of Israel. The stroke left him in a permanent, brain dead, vegetative state. It was not the final chapter of life a proud man could have wanted. A medical blog described Sharon’s final years: “With the help of modern medicine, his body soldiered on. His kidneys no longer worked, and he received dialysis to keep them operating. In 2013, he even underwent surgery to treat an infection related to his kidney failure”. Deprived of dignity, his body systems sustained by modern technology, Sharon lingered for eight years, largely forgotten by the world. Ramifications of his legacy, however, remain very much alive in Israel. Sharon embodied and acted on the worst elements of intolerance, racism and greed a nation can embrace. The impact of the path on which Sharon set Israel resulted in today’s self-imposed isolationism. 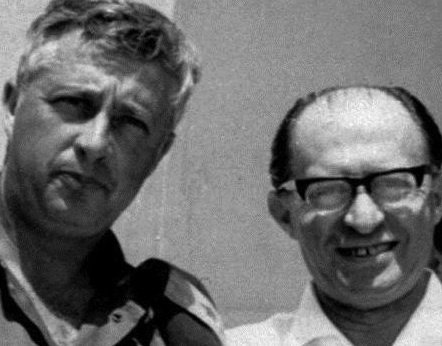 Thanks to a the legacy of right wing leaders like Sharon, and Menachem Begin (shown together above in a 1967 photo) Israel has been unable to resist the impact of a boycott movement that has attacked Israel’s economy and undermined its world image. As a demonstration of this isolation, no foreign leaders attended his final service, which was conducted Monday in front of the Knesset. The highest ranking world figure at the service was U.S. Vice President Joe Biden, a politician with an eye on 2016, who appeared as concerned about Israel’s close bond to the U.S. as he was about Sharon. Former British Prime Minister Tony Blair was there, not as a public official, but as the staff director of the Quartet (the United Nations, the European Union, the United States and Russia), itself a lingering, dying effort to sustain and monitor peace efforts between Israel and the Palestine Authority. It is a measure of how far Israel has fallen in world esteem that when the assassinated Israeli Prime Minister Yitzhak Rabin was buried in 1995, a sitting U.S. President and two former U.S. presidents were in attendance. Egypt was the only Arab state to send a low level representative to Sharon’s service. The last eight years have not been good for either Israel or a comatose Ariel Sharon. If you read or look beyond the main stream media, It is not hard to see why. Months prior to his stroke, Sharon “stunned” the world by forcibly withdrawing 10,000 Israeli settlers (and their military protectors) from Gaza. “Stunned” is the word used by Israeli narrators and repeated endlessly by media sycophants. It paints Sharon as a strong leader willing to work for peace. The Gaza withdrawal was not stunning; it was a shrewd, calculating, strategic military move to end a Gaza occupation that was not benefiting Israel. Gaza suffers under a joint Israeli-Egyptian siege, while Israel shrugs off any responsibility for its inhabitants. Though Israel controls the entrances, exits, airspace and coast of Gaza, and effectively regulates the caloric intake of each resident of the coastal territory, the occupation is over as far as its government is concerned. Israeli settlements are firmly entrenched in the West Bank and encircle East Jerusalem, reducing Palestinian areas to the “pastrami sandwich” of non-contiguous bantustans that Sharon had originally envisioned. With the peace process effectively embalmed in political “formaldehyde,” right-wing elements have achieved unfettered dominance over the Jewish state’s key institutions. Now that Sharon’s unilateral vision appears to have been consolidated, Israel’s government must perpetually manage an occupation it has no intention of ending. It has no clear strategy to achieve international legitimacy and no endgame. Its direct line to Washington has become a life-support system for the status quo. Like Sharon, who spent his last years in a comatose state without any hope of regaining consciousness, Israel is only buying time. History will not recall Sharon with favor. Mainstream media feels compelled to refer to his career as “controversial”, a term even Joe Biden felt he had to reference in his otherwise laudatory funeral remarks. “Controversial” is media code word for “we know there is bad stuff out there but you did not hear it here”. Sharon crafted the invasion of Lebanon in 1982. It was intended to allow him to put Christian allies of Israel in power in Lebanon. Likewise, he wanted to destroy the Palestine Liberation Organization, then headquartered in Beirut. The invasion, which had no basis in international law, resulted in the indiscriminate shelling of Beirut and the loss of some 20,000 Lebanese and Palestinian lives. . . During that war, Sharon bore responsibility for the massacre of women and children at the Sabra and Shatila refugee camps during the Israeli occupation. Remember that these Palestinians were refugees from Sharon and his fellow Israeli hawks in the 1948 war, when some 720,000 Palestinians were expelled from their homes and land and made penniless refugees. Now he had come after them and empowered far right wing Christian militiamen, who massacred them. Sharon hated the Palestinians because they refused to evaporate, and stood as a reproach to his ideology of Israelis’ birthright to Palestinian land. “In 1982, after the Israeli invasion of Lebanon and the massacre at Sabra and Shatila, the largest protest in the history of Israel came out against Sharon. A commission of inquiry headed by the Chief Justice of Israel’s Supreme Court, Yitzhak Kahan, determined that Defense Minister Sharon was negligent, and should have foreseen that permitting Lebanese Phalangist forces to enter the Palestinian camps carried the potential for catastrophe. Sharon was forced to resign. “The man did not have a social vision for his country; economics bored him. He must have known that he would only get a second chance when the drums of war began to beat again. It is not surprising, then, that when the Oslo Accords were concluded—promising peace at the end of an interim period—Sharon provocatively waged a fierce battle against the agreement. In March, 2001, Sharon was elected prime minister, the position he held until he suffered his stroke in January, 2006, ending a long military/political journey which, except for the occasional downturn, like Sabra and Shatila, continued from early military success to the prime minister’s post. 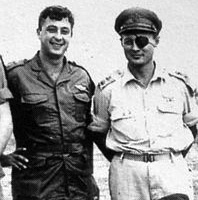 In 1955, he was photographed (at left) with Moshe Dayan, then the IDF Chief of Staff and later Israeli Defense Minister and Foreign Minister. “President George W Bush famously described Sharon as “a man of peace”. For the last 40 years the Arab-Israeli conflict has been my main research interest, and I have not come across a scintilla of evidence to support this view. Sharon was a man of war through and through, an Arab-hater, and a pugnacious proponent of the doctrine of permanent conflict. Following his rise to power Sharon therefore remained what he had always been – the champion of violent solutions. The dominant preoccupation of Sharon’s premiership was the “war on terror” against militant Palestinian groups. No peace negotiations with the Palestinian Authority took place between 2001 and 2006, and Sharon regarded this as something to be proud of. To his way of thinking negotiations necessarily involve compromise, and he consequently avoided them like the plague. . . . Traditionally,[in Israel] the concept of brain death didn’t exist, as death is considered the simultaneous shutting down of the body’s primary functions—from the pumping of blood to breathing and thinking. But with the introduction of technology to keep some body systems working—such as the heart and lungs—the need to redefine death became critical. And the idea of brain death—similar to a death caused by a heart that stopped beating or lungs that stopped breathing—seeped into the culture and legal system as Sharon hung on. In 2009, the Israeli government passed the Brain-Respiratory Death Law that addressed religious concerns about defining the line between life and death and the latest medical knowledge. It required that several brain scans and other techniques would have to verify an irreversible lack of brain activity in order to declare the patient brain dead. The law was an attempt to encourage organ donation from patients whose bodies were otherwise healthy, but whose brains had all but ceased to function. Even with the new medical criteria, however, some Israelis found it hard to relinquish religious concepts of life and death, and continued to find any life, even in a vegetative state, worth preserving. This entry was posted in Middle East Politics, Netanyahu. Bookmark the permalink. All I can say now is that this is a most enlightening and excellent piece of history, and it ads to my knowlwdge as well as my sense of horror that this matter has not been settled with a just outcomefor Palestinians, victims of the crime of being pushed out their homes. Vengeance is mine says the Lord. Good job, Jim. Exposing Ariel Sharon is like exposing a mindset (in concrete). The mindset lives on. The judicial commission and medical profession of Israel cumulatively imposed upon Ariel Sharon a more severe sentence than any international court of justice would or could have ever imposed for war crimes or crimes against humanity or peace. Yes, it is awesome, vengeance is mine says the Lord. — John Remington Graham of the Minnesota Bar (#3664X). Jim, many thanks for your outstanding piece on Ariel Sharon. It reminds us of the kind of cut-throat butcher he really was during his entire career. As early as 1953, Sharon led Israeli ground forces invading a small Palestinian town called, Qibya, in what is now the West Bank. Farmers had already gone to till their fields and un-be-knownst to them, Sharon had announced a curfew. Many were machine-gunned, as they were returning home from their fields. Additionally some 70 men, women and children were murdered, when Sharon’s forces blasted homes, knowing full well that their inhabitants were still in them. A few hundred were massacred that day of infamy, only 5 years after Israel was created on 78% of what was our Palestinian Homeland. In 1982, Sharon-led Israeli forces invaded Lebanon bulldozing his path of destruction and mowing down over 20,000 Lebanese and Palestinian civilians, refugees, and fighters. When he reached Beirut, he shook down his Lebanese Phalangist allies and humiliatingly rebuked them for “not doing their part” in helping the Israeli invasion. Sharon had a plan for the Phalangists to execute and he engineered it all. He, first, made sure that his forces marked the roads and paths (for night vision) that led to the Palestinian refugee camps of Sabra and Shatila. Sharon’s forces surrounded the Palestinian camps to make sure no one could escape and shot flares in the sky to illuminate the camps at night. Then, he let loose his Lebanese Phalangist allies to pour into the camps and slaughter and mutilate Palestinian women, old men and children. The slaughter went on throughout the night and next day saw more than 1,200 slaughtered and several hundreds who were taken by trucks to unknown destinations. Of course, there was no trace of them. In 1973 War Egypt’s initial victory in retrieving the Suez canal and part of Sinai from Israel, Sharon and the Zionist state could not have recovered, had it not been for the US “air bridge” to Israel that quickly resupplied it with tanks and planes. Finally, I have a slightly different perspective as to why Sharon was artificially kept alive. And this is my own personal hunch, based on past Zionist thinking. I believe that some Israelis were hoping that Sharon would come back to life, even though chances were remote. But, they probably figured it was worth trying. what a “great coup” it could have been, if he survived his coma. They would have been able to sweep the entire Fundamentalist Christian American camp off their feet, by concocting stories about Sharon coming back to life, just like some Prophet from the Old Testament. Too far-fetched? I can tell you stories about Israeli-Zionist spin, like “the land with no people for the people with no land”. Or, I can tell you about the “Lavon Affair” and many more. Best obituary on Sharon I’ve seen! Thanks. Sharon’s policies have become Israel’s policies. Cruel towards Palestinians, relentless in their stealing and demolishing of Palestinian land and property, ruthless towards “the other”. They covet all of Palestine, steel the land, and kill Palestinians at will. The religious establishment in Israel, which is orthodox Judaism, support and encourage these policies, So much for the Ten Commandments. Do religious leaders in Israel think the commandments only apply to Jews? I’m beginning to think yes. Not much more to say but agree with the earlier commenatators. Jim Wall has brought together his own reflections with the testimony of others about the several sides of Ariel Sharon. Some politicians, like George Bush at an earlier time, and our current vice president, have tried to cleanse the record of the truly beastly things that happened with Sharon’s nod of approval. Has a real historian ever been a politician? Some never stop trying to influence and even re-write history. But thanks to writers like Jim Wall, the record stands and speaks for itself. In the Seder, Jews are told that all Jews should think of themselves as having personally come out of slavery. I see that as being instructed to identify with the oppressed. Secondly, we are instructed that no one is free until everyone is free. Finally, we are told that Jews have an obligation to work for that universal freedom. This is why the state of Israel is NOT a Jewish state. It is a theocracy of hate and bigotry.